Lollo Verde lettuce is small to medium in size, averaging 15-20 centimeters in diameter, and grows in a tightly compact, rosette shape. The frilly and curled, fan-shaped leaves are light green in the center and transition to a darker, vibrant green around the edges. Connected at a central base, the leaves do not form a head and are made up of individual branches. Lollo Verde lettuce is tender, crisp, and chewy with a sweet and mild, nutty flavor. Lollo Verde lettuce is available year-round, with a peak season in the early spring. Lollo Verde lettuce, botanically classified as Lactuca sativa, is an Italian, loose-leaf, curly variety closely related to the lollo rosso lettuce and is a member of the Asteraceae family. Also known as Lollo Bionda, Lollo Verde is favored by chefs for its curly edges and tender, chewy texture, and is most commonly incorporated fresh into salads and sandwiches. 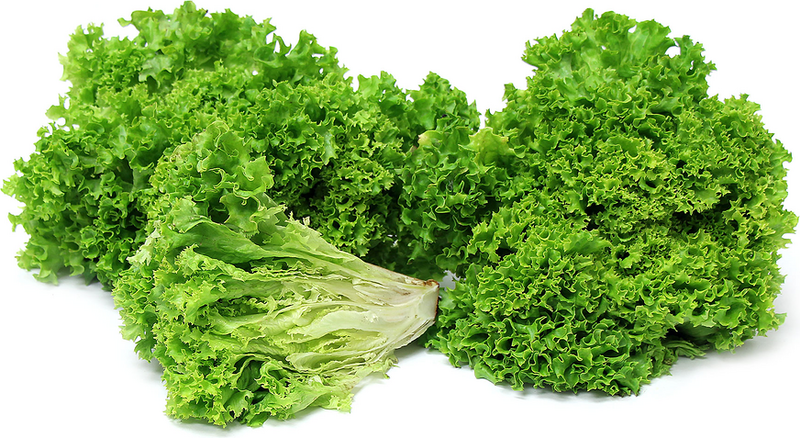 Lollo Verde lettuce contains vitamins A and C, folate, fiber, and iron. Lollo Verde lettuce is best suited for raw applications as its frilly leaves and mild taste is showcased when used fresh. The leaves are most popularly added to salads with other greens as the curly edges increase the surface area and have the ability to catch and hold salad dressing. The leaves can also be used as a garnish, layered in sandwiches or on toast, torn and sprinkled over soups, or served as a bed for cooked meat. Lollo Verde lettuce pairs well with avocado, radish, sprouts, tarragon leaves, mushrooms, cherry tomatoes, grapefruit, scallions, rice, ham, poultry, pork, eggs, cottage cheese, curry powder, sesame oil, and toasted pine nuts. The leaves will keep up to four days when stored in the crisper drawer of the refrigerator. Lollo Verde is a popular lettuce to cultivate in home gardens in both Europe and North America as it can resist extreme heat and frost, can grow in small spaces and is an attractive plant with bright colors and unusual textures. It is also fairly easy to grow, and individual leaves can be harvested throughout the season allowing new leaves to be produced. Lollo Verde is believed to be native to Europe, specifically Italy, but the exact origins are largely unknown. Today Lollo Verde lettuce can be found in online seed catalogs and at farmers markets and specialty grocers in North America, Africa, Europe, and Asia. Recipes that include Lollo Verde Lettuce. One is easiest, three is harder.